We bet you bought your last mobile phone online. Many people today prefer online shopping to the regular one, especially when it comes to things like electronic devices. Our bluish design is very pleasant to the eye, so the visitors will feel comfortable staying online as long as they need to choose the gadget they like. The newest mobile phones are featured in the slider. Banners and sidebar links enhance main navigation. Featured products are arranged in three columns and supplied with two call to action buttons. Overall, the store has everything for your eCommerce success. Bootstrap is really a cost-free front-end framework that creates for a lot quicker and also simple and easy website development practice. Bootstrap is an extremely useful instrument and that's the explanation it's very popular. With this framework, it is also possible to build up responsive design, suitable to any sort of display size, prototype cutting edge layouts without having any issues and ensure your own website is certainly cross-browser compatible. Responsive design renders a website page exact perfectly on any specific display screen size. Smart phones drive 80percentage of worldwide online utilization. It's important to design your web presence responsive in the event you do not desire to reduce your current potential customers. Search engine friendly layouts are enhanced as per the present day SEO specifications. This increases the possibility they will be spotted on the web, hence increasing your web-site's rating positions in search engine results. SEO helps to make it to the top of search engine results and fit the ranking factors necessary for the most common search engines. As a result, your website is visible on the web. When adding online chat as part of your website, you expand the possibilities that you'll be allowed to set up a much better interconnection with your potential buyers, consequently delivering an enhanced UX on your own website. What are the advantages of purchasing a Electronics News Shopify ecommerce theme? The major advantage of purchasing a Electronics News Shopify ecommerce theme is price: You get a high quality design for just $20-$70. You don't have to hire a web designer or web design studio. Second advantage is time frame: It usually takes 5-15 days for a good designer to produce a web page of such quality. How many applications, programs etc can I use to integrate with the Mobile Phones Store Shopify templates under one extended license? The extended license gives you the right to use the purchased Mobile Phones Store Shopify templates for the integration with one software/freeware/application/CMS/sitebuilder only. In case you would like to use the template with the other application, the other license is to be acquired. Can I resell Electronics News Shopify ecommerce templates I bought the developers license for? You cannot resell the customized Shopify theme for Techno News as a template, but you may sell it as a project to your client. I like the image from the Shopify ecommerce template for Mobile Phones Store and would like to use it for my advertising campaign, can you send me this image in a higher resolution? No, we can't provide image in higher size or resolution rather than it is on the Shopify ecommerce template for Mobile Phones Store. We recommend looking for professional images on online photo resources. Can I get the Shopify ecommerce template for Mobile Phones Shop in higher resolution to use for printing? No, we design Shopify ecommerce templates for Electronics Blog optimized for web resolution only. Make sure that these charges for Electronics Company Shopify template have different order IDs. If it is so, contact our billing department. Can I resell the customized Shopify design theme for Electronics News? No, you cannot resell the customized Shopify design theme for Electronics News as a template but you may sell it as a project to your client (see paragraph 1 ONE TIME USAGE LICENSE for more details). In what cases I don't need the extended license for Shopify designs for Electronics Manufacturing? Can I integrate the Shopify theme for Mobile Accessories Shop with third-party software or applications for development of my new products? No, you cannot get the developers license for development of Shopify theme for Mobile Accessories Shop or other products. Can I put low resolution thumbnails of Shopify designs for Mobile Accessories Shop on my website for my clients to choose designs? Are your Electronics Company Shopify design themescompatible with any CMS? Are there any limitations on selling the Techno News Shopify design as the integral part of my new product? What am I allowed and not allowed to do with the Mobile Store Shopify ecommerce themes? You may: Build a website using the Mobile Shop Shopify template in any way you like.You may not:Resell or redistribute templates (like we do).Claim intellectual or exclusive ownership to any of our products, modified or unmodified. All products are property of content providing companies and individuals.Make more than one project using the same template (you have to purchase the same template once more in order to make another project with the same design). Are there any restrictions for using imagery, cliparts and fonts from the Electronics Blog Shopify template I purchased? All imagery, clipart and fonts used in Electronics Blog Shopify template are royalty-free, if not stated otherwise on the product page, and are the integral part of our products. One Time Usage License and Developers License give you the right to use images, clipart and fonts only as a part of the website you build using your template. You can use imagery, clipart and fonts to develop one project only. Any kind of separate usage or distribution is strictly prohibited. Will the Shopify template for Phones Shop be deleted from TemplateMonster database? No, the Shopify template for Phones Shop will not be deleted from TemplateMonster database. Is it possible to use your Mobile Store Shopify ecommerce themes to develop websites for my customers? Yes. It is perfect for designers who want to offer their customers a high-quality design and also save time and money. Keep in mind that when you purchase the Shopify theme for Electronics Repair with ordinary or exclusive license you're entitled to create only one project (one domain name). Is it reasonable to make unique purchase of Shopify ecommerce theme for Electronics Manufacturing that was already purchased before? Yes, it's reasonable to make a unique purchase of Shopify ecommerce theme for Electronics Manufacturing. Because there is very small chance that you will find the same design on the net. There are more than 3,000,000,000 webpages online now according to statistics on www.google.com. Is there any return policy for Shopify design themes for Techno News? Requests for a refund are accepted at www.template-help.com/tickets within the period of 2 weeks after the order of Mobile Accessories Store Shopify design is placed. You should accompany this request with detailed and grounded reasons why you apply for a refund. Please make sure your request does not contradict the terms and conditions specified in the policy. A refund is issued to you upon receipt of a Waiver of Copyright signed by you. What is Extended License for Shopify ecommerce theme for Electronics Manufacturing? Is it possible to reactivate my download link for Electronics Supplier Shopify template if it was deactivated after 3 days? Yes. Please re-activate the download link for Electronics Supplier Shopify template within your account under the Downloads tab or contact our billing department directly regarding that. What is the price for acquiring the extended license for Shopify theme for Mobile Accessories Shop? There is no set price for acquiring the extended license. The price is based on the Shopify theme for Mobile Accessories Shop's unique price for those templates you would like to use for the integration. The price for purchasing license for a single template is half of the template unique price. Can I contact the Mobile Accessories Store Shopify design author? Yes. You can contact this Mobile Accessories Store Shopify design author/author's team directly using your personal account under the Support tab. Can I customize the Shopify ecommerce theme for Mobile Shop? Yes, you can customize the Shopify ecommerce theme for Mobile Shop to any extent needed. You cannot use a header of the template for one project though, and images from the template for the other project. Will TemplateMonster help me to install my Shopify theme for Electronics Repair? Some of our products like osCommerce templates, Zen Cart templates, etc. require installation to operate. Installation services are not included in the package price. TemplateMonster though offers you a variety of sources to help you with installation of your Shopify theme for Electronics Repair including installation instructions, some articles with our Online Help Center. Our Knowledgebase contains customers questions and most frequent problems. Anyway, you can always refer to our partners from TemplateTuning.com to install your Shopify theme for Electronics Repair for you for a small fee. Can I resell the Shopify ecommerce template for Mobile Phones Shop as is? 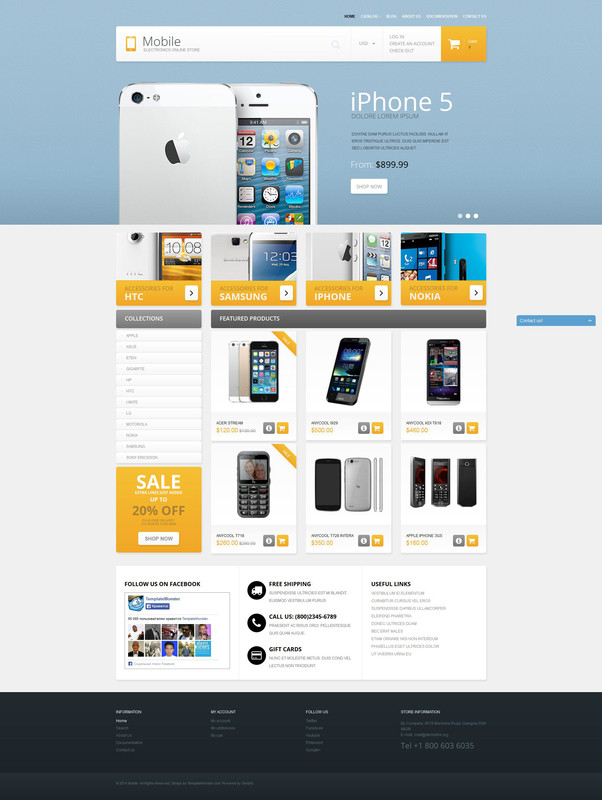 No, you cannot resell the Shopify ecommerce template for Mobile Phones Shop as is. Can I customize the Shopify theme for Techno News if that's required by application settings? Yes, you can customize the Shopify theme for Techno News code, graphics, fonts to any extent needed.